A band of rebels from a galaxy far, far away has helped Disney finally join the ranks of winning stocks this year. Shares of Disney (DIS) rose 2% Monday following the strong global box office for "Rogue One" -- the first of several planned spin-off movies in the "Star Wars" franchise. The stock was also added to Bank of America/Merrill Lynch's so-called "U.S. 1 List" of top stocks for next year. So that probably helped lift Disney Monday too. As a result of Disney's move higher, the stock is now up slightly year-to-date. That means that only two of the thirty stocks in the Dow have completely missed this year's rally and are still lower for 2016: Coca-Cola (KO) and Nike (NKE). Still, Disney's shares haven't exactly been in Wall Street's version of hyperspace this year. Disney continues to lag the market -- and, more tellingly, nearly all of its major media rivals -- due largely to concerns about the health of its ESPN cable network. Those worries haven't gone away. The high cost of sports programming -- particularly for the National Football League's Monday Night Football franchise -- has spooked investors, especially amid the NFL's weak ratings this year. Wall Street is also worried about the fact that more and more consumers are cutting the cable cord, which has led to a steady decline in subscribers for ESPN. The surprise departure of former Disney chief operating officer Thomas Staggs earlier this year hasn't helped the House of Mouse either. Staggs was considered the likely successor to current CEO Bob Iger, who is expected to retire once his contract expires in June 2018. There still isn't any more clarity about who could eventually take over for Iger. And ESPN's problems haven't magically gone away even though ratings for the NFL have improved a little bit in the past few weeks. 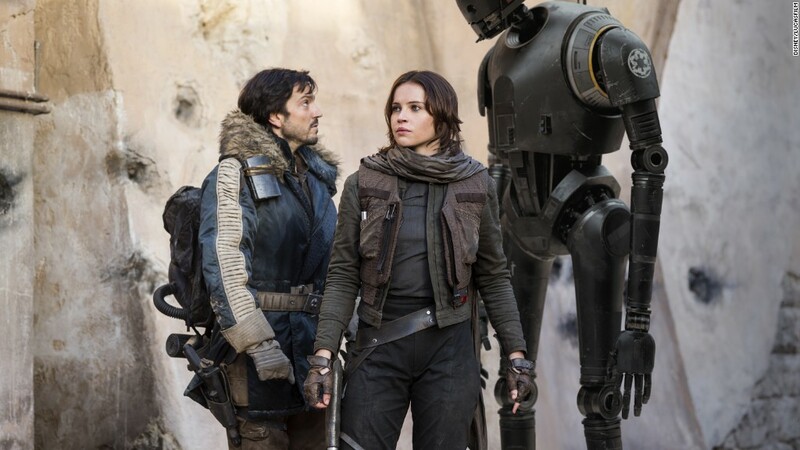 But the strong debut of "Rogue One" is undeniably good news for Disney. It shows that fans are more than willing to go see more movies about the Force even if they aren't directly tied to the core story of Luke, Leia, the (spoiler alert!) late Han Solo (sniff sniff) and the events tied to the original Star Wars trilogy. Disney has continued to mint money from Star Wars -- which also helps its theme parks and consumer products division. And the eagerly anticipated (and as of yet unnamed) Episode VIII of Star Wars -- the sequel to "The Force Awakens" -- is due out in December 2017. A separate movie about young Han is also in the works. But Disney's stock has still done worse than NBCUniversal and DreamWorks Animation owner Comcast (CMCSA), CNN and Warner Bros. parent Time Warner (TWX), CBS (CBS) and Rupert Murdoch's Fox (FOXA) this year, despite its overwhelming success at the box office. Disney also owns Marvel, Pixar and its own namesake studio was as well as Star Wars maker Lucasfilm. And Disney churned out several big hits from all those studios this year, such as "Zootopia," a live action version of "The Jungle Book," "Captain America: Civil War," "Doctor Strange," "Moana" and "Finding Dory." According to figures from Hollywood research firm Box Office Mojo, Disney films have grossed more than $2.5 billion at U.S. movie theaters this year -- nearly a quarter of the entire industry's take in 2016. So Disney will probably need to stop the bleeding at ESPN and come up with a new succession plan to keep investors happy in 2017 -- even if the Force seems to be with its movie studios. Always.